Holiday Home Sossego has 150 m² with a private garden of approximately 600 m². 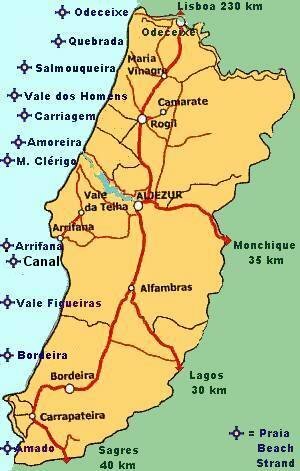 Located in the natural reserve of the Costa Vicentina in the Western Algarve, in the municipality of Aljezur, in a quiet area of Vale da Telha in Sector E. Vale da Telha is situated between Aljezur 6 km distance and 4 km to the central beaches of Aljezur, M.Clérigo and Arrifana. The large beach of Amoreira is 6 minutes away by car and crossing the river mouth at the beach by foot when the tide is out. Restaurants and a small supermarket are within 1 km. The nearby hotel pool can be used by guests of the holiday apartment, by paying a small entrance fee. Holiday home Sossego, ground floor, has a private garden with lawn, equipped with portable BBQ, table, chairs and loungers. On the second floor, completely separate from the main house and the privet garden of the house, apartment Barbara. (1 bedroom) is located with separate entrance and garden. Holiday home Sossego has 2 closed terraces and 1 open terrace, 3 bedrooms (2 double beds , 2 twin beds), 2 bathrooms (2 shower cabins), fully equipped kitchen (dishwasher, coffee machine , toaster, kettle, ceramic plate, electric hot air oven), living room and dining room with TV and closed fireplace + TV Astra, storage room (washing machine). On request, a baby cot can be supplied. The prices are valid for 6 persons and a minimum stay of 7 nights. *Exceptions: from 15.07. - 15.09. no discounts are made. The New Year week is counted as high season. Longterm rental from 01.11.-01.06.: 700 €/ month from 3 Month on. For final cleaning there is an extra charge from 50,00 €. Bedding and towels are supplied.